About "Construction of perpendicular from a point on a line"
Even though students know what is perpendicular line, many students do not know, how to construct perpendicular from a point on a line. 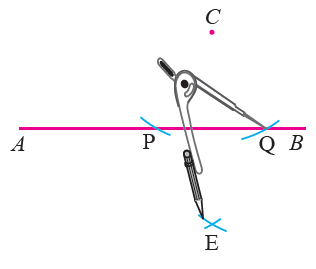 Here we are going to see "How to construct perpendicular from a point on a line step by step"
To construct a perpendicular from a point on a line, you must need the following instruments. 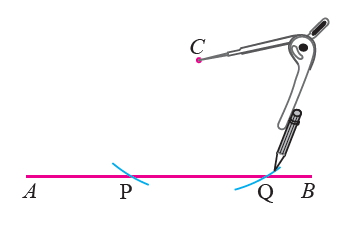 The steps for the construction of a perpendicular from a point on a line are. Draw the line segment AB and mark external point C at somewhere above the line segment AB. 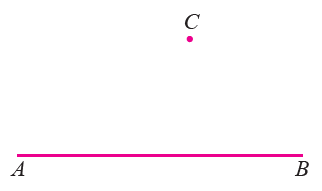 With C as center and any convenient radius draw arcs to cut the given line at two points P and Q. With P and Q as centers and more than half the distance between these points as radius draw two arcs to intersect each other at E.
Join C and E to get the required perpendicular line. 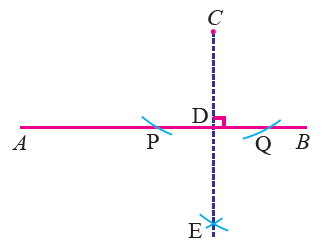 In the above figure, CE is the perpendicular to the line segment AB from the external point C.
This construction clearly shows how to draw the perpendicular to a given line segment from an external point with compass and straightedge or ruler. A line which intersects the another line at right angle is called as perpendicular. In a triangle, an altitude is the line segment drawn from a vertex of the triangle perpendicular to its opposite side. 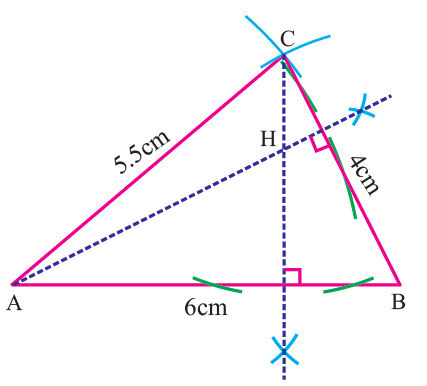 The point of concurrency of the altitudes of a triangle is called the orthocenter of the triangle and is usually denoted by H.
Construct triangle ABC whose sides are AB = 6 cm, BC = 4 cm and AC = 5.5 cm and locate its orthocenter. 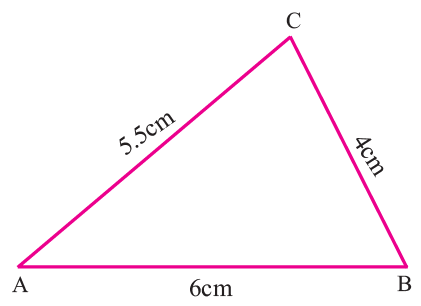 Draw the triangle ABC with the given measurements. 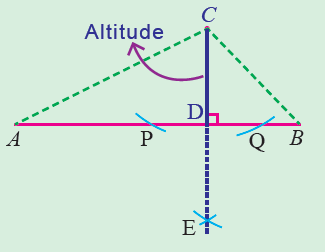 Construct altitudes from any two vertices (A and C) to their opposite sides (BC and AB respectively). 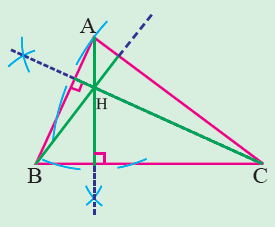 The point of intersection of the altitudes H is the orthocenter of the given triangle ABC. After having gone through the stuff given above, we hope that the students would have understood "Construction of perpendicular from a point on a line"